We’d love your help. Let us know what’s wrong with this preview of Why Smart People Make Big Money Mistakes and How to Correct Them by Gary Belsky. In their fascinating investigation of the ways we handle money, Gary Belsky and Thomas Gilovich reveal the psychological forces—the patterns of thinking and decision making—behind seemingly irrational behavior. They Protect and grow your finances with help from this definitive and practical guide to behavioral economics—revised and updated to reflect new economic realities. To ask other readers questions about Why Smart People Make Big Money Mistakes and How to Correct Them, please sign up. "Why Smart People Make Big Money Mistakes And How To Correct Them" is one of the best finance books I've read so far (it's more finance and economics). It's a very nice blend of finance and psychology -- the field formally known as behavioral finance. Since the first edition of the book was published in 1999, I was concerned that the content might be dated. What I forgot was that the way humans think and behave doesn't change in a few decades. As such, most of the cited research and learnings still hold true. Which bring me to the best thing I liked about this book -- the authors pull in and quote a TON of research. This whole book could be described as an aggregation of behavioral finance research done by a few authors. Each of the eight chapters covers something unique and the book itself doesn't feel fluffed. Each chapter has a very readable, skimmable and consistent format. I do recommend reading page to page and not skimming if you're interested in the subject matter. Speaking of the format, each chapter starts with a thought-provoking story or situation, explains what the actions and influences are, and ends with warning signs and ways to improve. What I didn't like about the research is lack of diversity in quoted material. Most of the cited research is by Tversky and Kahneman. Now that could very well be because those two did the most work in this field (did they? I don't know), but I'd still like to see a diverse collection of research. A great supplement to Thinking, Fast and Slow and Freakonomics. There is only so much behavioral economics research out there, so overlap with prominent books is unavoidable. Re-reading huge swaths of material cheapens the experience and you must carefully plan any behavioral economics kick. I've spaced the books over several years and I've found that the studies cited have clung to my brain like cicada--I remembered nearly everything. 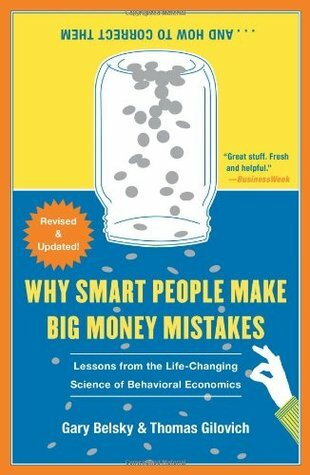 Why Smart People Make Big Money Mistakes And How To Correct T A great supplement to Thinking, Fast and Slow and Freakonomics. There is only so much behavioral economics research out there, so overlap with prominent books is unavoidable. Re-reading huge swaths of material cheapens the experience and you must carefully plan any behavioral economics kick. I've spaced the books over several years and I've found that the studies cited have clung to my brain like cicada--I remembered nearly everything. Why Smart People Make Big Money Mistakes And How To Correct Them can be classified as (mainly) Kahneman and Tversky's research applied to personal finance. Ironically, this is what many people picked up Thinking, Fast and Slow hoping it would be. Way more approachable with sharp writing, this is a great book. However, the book did next to nothing for me as I'd previously read almost every study that was recounted in the book and read several personal finance blogs regularly. While I made it through the whole thing, I grew tired of it by chapter six. If you only read one book on behavioral economics, this should be it. If you plan to read several, you need to start with Thinking, Fast and Slow or it will be valueless after seeing the concepts applied here. Quick read, but not enough original or thought provoking content to make it memorable. There are other more worthwhile books out there that cover similar themes. The advice was too generic to be applicable/practical and some of the more interesting concepts were given too simplistic a treatment to make them engaging. It probably would have been interesting and novel to someone who hadn't read any behavioral economics books before. I found this book fascinating. So fascinating that I read it in one four hour flight with yapping seat partner. It looks at behavioral/psychological reasons we make the choices we do with our finances. The games and quizzes illustrate just how common our decisions are and explains why we make those choices. I learned that I'm not as different or savvy as I thought I was. Also, some great financial tips and ways to gain different perspectives to help us make wise financial choices. Um dos melhores livros que já li sobre economia comportamental aplicada a finanças e investimentos. Sem rodeios, os autores explicam como os vieses e as heurísticas impactam em nossa tomada de decisão no momento em que estamos vendendo/comprando ações, escolhendo onde investir, poupar e etc. Com perguntas para o leitor responder no estilo de joguinhos para facilitar a absorção do conteúdo, e também com muitas pesquisas no campo das ciências sociais, economia comportamental, neurociência e psicolog Um dos melhores livros que já li sobre economia comportamental aplicada a finanças e investimentos. Com perguntas para o leitor responder no estilo de joguinhos para facilitar a absorção do conteúdo, e também com muitas pesquisas no campo das ciências sociais, economia comportamental, neurociência e psicologia. Ao final de cada capítulo há um resumo do que foi abordado com dicas (no estilo bullet tips) para ajudar. Obrigatório para quem quer entender mais sobre o comportamento atrelado a finanças e investimentos. Výborné postrehy z behaviorálnej ekonómie. Objasnilo mi to určité rozhodovacie procesy pri výdavkoch alebo investovaní. Every Lebanese citizen should read this book! This is a great book: fun to read with lots of great information, not strictly financial advice but an exploration of behavioral economics (using psychology to explain some of the choices we make that seem at odds with our best interest). Chapters are introduced with a story and you are asked to react; the authors then explain how the situation or presentation influences your choice. -mental accounting can be good (setti This is a great book: fun to read with lots of great information, not strictly financial advice but an exploration of behavioral economics (using psychology to explain some of the choices we make that seem at odds with our best interest). Chapters are introduced with a story and you are asked to react; the authors then explain how the situation or presentation influences your choice. This book made for a quick yet informative read as the authors explored behavioral economics and explain why what we intuitively think is right or best for us financially isn't always so. If you've read titles like "Freakonomics", quite a bit of the material may seem familiar. But unlike "Freakonomics", the authors spent more time focusing on the basics of behavioral economics so that you can understand the key concepts that drive this field of study. First published in 1999, I was concerned tha This book made for a quick yet informative read as the authors explored behavioral economics and explain why what we intuitively think is right or best for us financially isn't always so. If you've read titles like "Freakonomics", quite a bit of the material may seem familiar. But unlike "Freakonomics", the authors spent more time focusing on the basics of behavioral economics so that you can understand the key concepts that drive this field of study. First published in 1999, I was concerned that the book may feel dated. But it didn't feel dated at all especially with the advantage of hindsight to see how the authors often predicted the behavior of individuals and institutions in the run up the collapse of the financial markets in 2008. A fine book - the only reason I didn't rate it higher is that if you've read any of the popular literature about behavioral economics before, you will be familiar with the bulk of the book. The authors do a good job of relating those conclusions to financial matters, but knowing the "wow, people ARE irrational!" experiments removes some of the more interesting parts. Loved reading this book. It gave an insight to our relationship with money and why we act the way that we do with money. Some of the concepts weren't new to me as I have read about them in Dan Ariely's book. I guess, there are just a few studies on which to base their writing. Nonetheless, this is a good eye opening book if you've always wondered why you do the things that you do with money. How behavioral economics affect your decisions and how to mitigate them. I don't feel like I learned a lot since I generally follow the suggested principles in the book but I agree with them and there were some things I hadn't read about before like eliminating equally weighted items on a pros/cons list to help you make your decision. Very handy book, I enjoyed it both as a person interested in behavioral economics, and as someone who wants to manage his money wisely. Some of the stuff is more known to people who are already familiar with Cahneman or Arieli, but there's a lot of new stuff as well. Lightly and humourously written, with points of summary at the end of each chapter - great handbook on the subject. An older book 1999 on behavioral economics that serves as a nice foundation. Easily readable but slightly annoying format that's a bit too simplistic. First book I've read about behavioral economics, really interesting in how it tackles the psychology behind why we make certain decisions (both in our own interest and not). Just OK. Made some fairly interesting points, but overall pretty obvious and boring. Interesting how they combined psychology with the way we spend money. Rather rudimentary with few (or none) applicable new ideas. easy read. A pleasant summary of introductory material. Readers that are mildly familiar with the subject discussed will find nothing new in this book. This book looks at the behavioral psychology of why people make the financial decisions they do. We place different values on the same dollar amounts. Often, money that comes as a bonus, for example, we treat much different than the money we earn. This can be detrimental if we are paying high credit-card interest, and keeping money in a savings account for a rainy day – as long as the rainy day hasn’t arrived, we are losing money. You’re shopping for a lamp that sells for $100. You discover one across town for $75 – would you make the trip? Now you’re shopping for a dining room set, which sells for $1775. You discover one across town for $1750, would you make this trip? This solves the great mystery of why people who aren’t reckless spenders can’t seem to save enough. They are money-wise in some areas – like the large purchases – but loosen their disciple with the “smaller” purchases at the grocery store, for example. You can use mental accounting to your advantage by having your investment money taken right out of your paycheck – it will never be seen or missed that way. Because we are so scared to lose, we do things that don’t allow us to win. Like sell stocks when the market goes down, because we don’t want to lose more. Or making decisions based on how much we have already spent on it, not the true future of it. You get a $1000 bonus from work, and a chance for more. Either $500, or flip a coin between $1000 more or 0. Now suppose you get a $2000 bonus from work, but need to do one of the following: give $500 back or flip a coin between giving nothing back or $1000. Most folks would take the sure $500 in the first case, but flip the coin in the second. Why? Because they are afraid to lose what they perceive as already theirs. There are two vacation packages. One has average weather, average beaches, medium-level hotel, average nightlife, and medium temperate water. The second has lots of sunshine, gorgeous beaches/coral reef, ultramodern hotel, very cold water, very strong winds, and no nightlife. You are asked to make a reservation. Which do you chose? Now suppose you are told you have reservations for both, but need to drop one. Which one do you drop? When people view a decision as one of preference, they focus on the positives. When asked to cancel a reservation, the focus is more on the negatives. This aversion to loss keeps too many people out of the stock market. It also keeps people holding on the losing investments for longer than they should (something about making the loss final by selling the loser). They use the analogy of seaworthy boats compared to investments. We wouldn’t give up on the strong boat because we feel it had run its course, and abandon it for a boat with holes because it hadn’t yet had it great days. Yet we often sell the good stocks to go after poor performing ones. We generally put too much emphasis on things we already own. Asked to choose between 4 investment options, students chose: 32% a medium-risk stock, 32% a high risk stock, 18% a T-Bill, and 18% a CD. But told they already owned one of the investment options, and their choice was to change it for another, then 47% chose to stay with what they already owned (no matter which investment choice they were told they owned). Often, the “regret aversion” keeps us from doing something. People can be so afraid of regret they will go to great lengths to avoid it. Mr. A is waiting in line at a theater. When he gets to the ticket counter, he is told he’s the hundred thousandth customer and he won $100. Mr. B is waiting in line at a theater. The man in front of him wins $1000 for being the one millionth customer, and Mr. B wins $150. Would you rather be Mr. A or Mr. B? Some people would actually want to be Mr. A just so they would avoid the pain of knowing they almost won – but didn’t win – the higher prize. Jason Zweig at Money reminds people that someone investing in a lousy stock and sticking with it is probably better off then someone who didn’t invest in stocks at all. Inflation is probably the biggest number we get fooled by. What our home is worth, how the stock market moves, etc. needs to be adjusted for inflation. An example of numbers fooling us (and probably some regret aversion playing its hand too) is buying insurance. We get low deductibles because we don’t want to pay out-of-pocket charges when we file a claim. Yet we fail to account for the low odds of filing a claim (about 1 in 10 in any given year). Compound interest is another number formula that fools us. Jill invests $50/month into a mutual fund earning 10%/year from age 21 to 29. John, her twin, also invests $50/month into the same fund, but starts at age 37. When they both retire at 65, which account has more money in it? (All told, John invests $22,200, Jill just $4,800). Jill has $256,650 and John has $217,830. Little numbers (like the expense ratio in a mutual fund) can add up to be big numbers over time. Once we make a decision (even though the decision is based on thin information), we become biased toward that thinking. Students were asked what percentage of African nations were in the United Nations. Before they answered, the teacher spun a wheel with numbers from 1 to 100. Students were told to guess if the number was above or below the random spun number, and then give their actual guess. When the random number was 10, the average guess was 25. When the random starting point was 65, the average guess was 45. This works well in bargaining nations, where the starting price becomes an automatic anchor. Suppose there are 4 cards, each with a number on one side and a letter on the other. The four cards show A, B, 2, 3 and you are asked to prove the following statement by turning over the least number of cards: every vowel has a even number on the other side. The answer is A and 3. We often can’t get to this answer because it requires we challenge the anchor in our mind that the statement is true. Broaden your board of advisors, so your anchors see the light of day. How do you pronounce the capital of Kentucky: “Loo-ee-ville” or “Loo-iss-ville”? Now how much do you bet you know the correct answer to the question: $5, $50, $500? The truth of the matter is people are over-confident when it comes to their own abilities. For example, 68% of lawyers involved in civil cases believe their side will prevail. (The answer to the above question is that Frankfort is the capital of Kentucky). We are poor at guessing how long projects will take (vastly under-guessing). When we attempt to pick winning stocks, we may also be falling prey to over confidence. 75% of all mutual funds – run by full-time investors – fail to beat the market. From 1991 to 1996, the average return was 17.7%, while the 20% of households that traded the most earned an average return of just 10%. But we stay overconfident. We remember things as, “heads I win, tails it’s chance.” When something goes right, we take mental credit, and when things go wrong, we attribute it to other causes which we didn’t have control over. When you make financial decisions, ask your trusted friends about your decision-making process. Not just the result (they may also be over-confident in their answers), but in how you went about making the decision. Often we “invest with the herd.” Because others think a stock is worth X, we believe it must be worth that. From the same time period, the average investor in a stock mutual fund earned 6.3%, while the average investor in a bond mutual fund earned 8 percent. This is because investors don’t buy and hold well-researched funds; they switch funds or get in and out of the market. Often because they are chasing the latest fund with spectacular advertised returns. But often a fund does best just before its strategy slows down. Those who tune in too closely to financial news (print, TV, etc,) probably fare worse than those who tune out. They will buy and hold better than those who are constantly hearing about their investments. Avoid “hot” investments. It’s a good rule to live by (like something that sounds too good to be true, probably is). Don’t date your investments, marry them. Look for opportunities to be a contrarian. Finally, buy index mutual funds and sit on them. My review is a bit skewed. Raise your hand if you like economics? Personal finance? Psychology? For me, all 3 topics are really interesting and fun to learn about. This merges all 3 so if they aren't your cup of tea this one may not be for you. Regardless though, the book is a quick read that is engaging. The authors have a fun way of drawing you in and provide lots of predicaments to think through to prove their points, often about the shortcomings of human psychology in decision making. Having My review is a bit skewed. Raise your hand if you like economics? Personal finance? Psychology? For me, all 3 topics are really interesting and fun to learn about. This merges all 3 so if they aren't your cup of tea this one may not be for you. Regardless though, the book is a quick read that is engaging. The authors have a fun way of drawing you in and provide lots of predicaments to think through to prove their points, often about the shortcomings of human psychology in decision making. Having studied these topics before I've seen many of these puzzles before (after all this book was written 20+ years ago!) and yet I still found myself giving the situations a fresh look and my mind fell into many of the same traps. Stupid brain! I appreciate the authors' description of personal finance being quite a bit like losing weight, you still have to eat, you can't just stop everything while you figure things out. You have to lose some battles while you fight to win an increasing amount of them. The only negative I would mention is that increasingly the book progressed into using investing as an example or framework for discussion. While that is interesting and enlightening, I found the other personal finance examples much more interesting. Perhaps that is because I've spent my career contemplating investing options and behaviors. One of the best books that I have read on behavioral finance. The book is well organized into various chapters with each focusing on specific trait. And each chapter has numerous examples to illustrate the concept & is concluded with nice action items. This is a practical book that shows, through studies and other academic work, how psychology works against our pursuit to make smart financial investment decisions. The book is elucidating for all, as it provides some steps to improve financial decisions, and is written in an engaging style. Excellent primer on making smart financial decisions! Good walkthrough of essential aspects to consider in making financial decisions and staying healthy when it comes to your bank account health. Totally absorbing. Simple and good advice for experts and novices alike. This book has some good insight on psychology that I had not been exposed to before but the finance/investing advice is pretty basic.